I’d kind of forgotten how the entire Marc Jacobs Spring/Summer 2012 collection was stolen from a train. I know, how could I? The big train that made up a large part of his Autumn/Winter presentation was a pretty obvious reminder, but there we have it – I was so entranced by the steam trains, porters and those big hats that the inspiration somehow faded into insignificance. Anyway – Marc hasn’t forgotten. 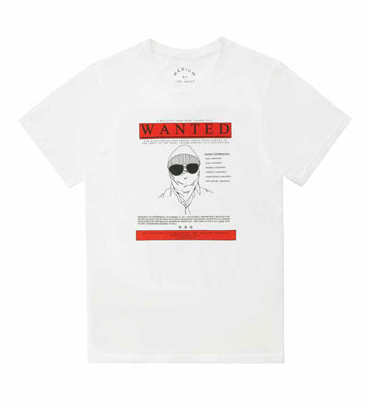 The latest addition to his ‘Special Items’ section (ie, the stuff we can afford) is a Wanted t-shirt, enabling Marc fans across the world to unite in the hunt for the criminal mastermind behind the heist – or at least to buy something that will make Marc more money to make more amazing collections. Whatevs, I’m getting one. Really do think MJ might have the best sense of humour in fashion. It’s $28 online or probably about £15 in store in the UK.